SOLD OUT! Today only, Apple authorized reseller B&H Photo is slashing the price of Apple's 11-inch MacBook Air by $800, bringing the price down to $849.95. This model (MJVR2LL/A), which features a 2.2GHz Core i7 processor, 8GB of memory and 512GB of storage, also qualifies for free shipping — and B&H will not collect sales tax on orders shipped outside NY and NJ. For those looking to get their hands on an 11-inch MacBook Air before they disappear for good, this loaded configuration from B&H is the last available from an Apple authorized reseller with Adorama and MacMall completely sold out, according to our 11-inch MacBook Air Price Guide. 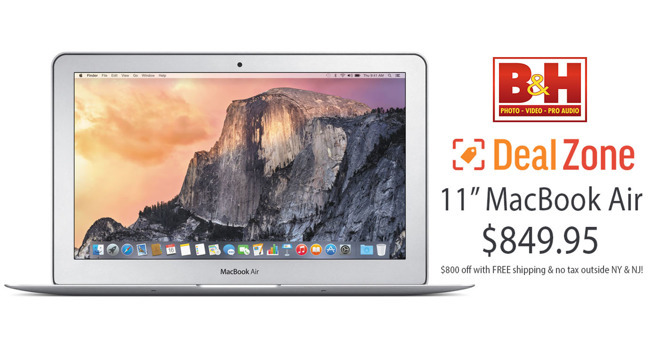 You can easily tack on an AppleCare extended protection plan to this 11-inch MacBook Air from B&H at a discounted rate of $229 by selecting the AppleCare option immediately after you press the "Add to Cart" button on B&H's website. Or just use this link.